Hi, my name is Jacqui Good and I am so proud to introduce you to Thistle Be Good, my first “baby” and an absolute passion of mine. Having left Scotland to travel the world in 1998, I stumbled upon and fell in love with South Australia and its people and have lived here ever since! In 2002, I established Thistle Be Good in my small home kitchen in the beautiful McLaren Vale wine region, 45km south of Adelaide, South Australia. Being passionate about good quality ‘clean’ food, and mainly using only healthy recipes for myself, I was interested in working with good, local ingredients. As I am Scottish, I chose the ‘Thistle’ (being Scotland’s national flower) and my surname, ‘Good’ for my business name – the perfect synergy! Hence Thistle Be Good was created. Prior to the patchwork of vineyards being established throughout the McLaren Vale and Willunga area, almond orchards abounded. An iconic local chef, Russell Jeavons (of the famous Russell’s Wood Fired Pizza in Willunga) introduced dukkah (which is gluten free) into this area back in the 1980’s. His inspiration behind its production came from what remained of these original almond plantings and the local wild fennel that grew in the creeks. Thanks to Russell, dukkah became an established part of the local culture and was a big influence for me to establish Thistle Be Good. . In 2002, I was the sole ‘employee’ and I made 12 tubs of beautifully crafted dukkah a week. I now make a whole lot more than that and have commercial premises in Willunga to make all of my goodies. Thistle Be Good was one of the first businesses to produce dukkah on a commercial scale, and is now, I believe, the largest (and of course, I believe, the best) dukkah producer in Australia. I have wonderful staff that make all this possible (I am so lucky to have such an amazing team). 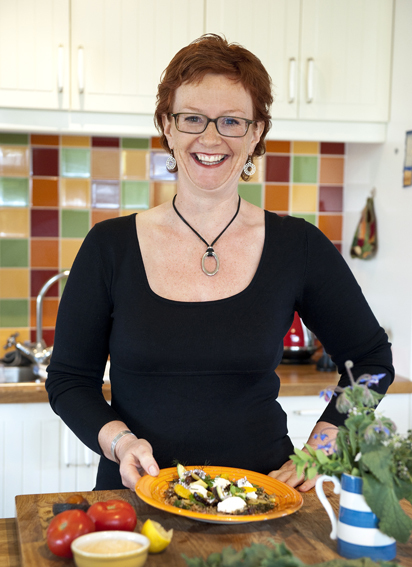 I use only healthy recipes to produce a range of 3 dukkah and over the years I have introduced further products which now include a ready to cook flavoured Quinoa, Risotto and Couscous which are all made with natural products and have no additives. A lot of my products are gluten free. I was one of the first people to do flavoured quinoa in Australia and mine are so tasty – you really have to try them to believe how tasty they are! No more bland quinoa for you! Our range of flavoured Ancient Grains were released in July 2016 – soooo excited with them. The flavour combinations and high levels of nutrients is fantastic – check them out on our products page. My mission and focus is to produce the most flavoursome food that I can, using the best ingredients that I can access. I eat really good, tasty food and would never produce anything for you that I do not thoroughly enjoy myself. You can be assured of great quality and delicious meals when you use my products. I also appreciate that we need quick, tasty and healthy ready/quick meal options. I hope that I can make your life just that little bit easier by giving you these products.